Nicky, a former French teacher who is terminally ill with ovarian cancer, was part of a New York University study to use hallucinogens to ease anxiety and more easily face death. 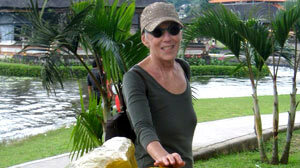 She is shown here on vacation in Bali. For the last eight years, Nicky has struggled with advanced ovarian cancer, and despite repeated rounds of chemotherapy and radiation, it's unclear how long she has to live. "Ovarian cancer has a very bleak outlook -- less than 30 percent make it to five years," said the 67-year-old former New York City French teacher. "I was diagnosed in 2002, and I was going in to my fourth year and had a recurrence -- which was like the proverbial shoe dropping -- and it frightened me so much." "For the moment, there is no pain," she said. "The most difficult part is leaving this world early. I wasn't ready to get on that bus." Coming of age in the drug-infused 1960s, Nicky, who, for privacy reasons, did not want to use her last name, didn't smoke marijuana and avoided the hippie sub-culture. "It never interested me," she said. "It wasn't necessary in my life." But last May, Nicky volunteered to take a psychedelic "trip" on psilocybin -- the hallucinogenic compound from "magic mushrooms" -- which has been used for thousands of years by indigenous cultures to reach higher levels of spirituality and consciousness. Today, even after losing seven friends from her cancer support group in 15 months, Nicky said she is less afraid of death and is living her life more "honestly and authentically." Nicky was one of the first terminally ill participants in an ongoing study at New York University on the use of hallucinogens to help those with terminal illnesses. "I had a wonderful life, a fabulous child and beautiful grandchildren, and here my life was cut short," she said. "I thought of my two granddaughters and not seeing them growing up and graduating from college -- it made me profoundly sad. I wanted to do something for myself, to be able to live more in the moment, rather than worrying about the future and having all these existential thoughts about what life was all about." Her "trip" took place under full medical supervision in a warm, living room-like setting with art books, fresh fruit, flowers and soothing music. She was given a pill in an earthenware chalice and a single rose, then hunkered down on a cozy sofa with eyeshades and headphones. "I was in a dome and it was all bejeweled with colors, mostly striped, like a kaleidoscope, but not turning," she said. "Every once in awhile, the dome would open up at the top and send a luminescence," she said. "I was in awe and could feel myself taking deep breaths. At the same, tears were running down my face, but I was not crying." "It was incredible," she said. "I wanted to share it. I couldn't believe the world could be so beautiful." Researchers at New York University say that in a controlled setting, hallucinogens, which alter perception and cognition, can help patients reduce the anxiety, personal isolation and fear of death. "I am still not ready to die," said Nicky, who just returned from trips to Mexico and Bali and boxes with a trainer several times a week. "It's definitely improved my interactions with those closest to me and figuring out how I want to live my life." "Has my anxiety of dying gone away? I would say no, I don't ever want to die. Will I be able to walk toward death with a little less fear? Perhaps," she said. "I know it sounds trite, but I live more in the moment," she said. The three-year study, "Effects of Psilocybin on Anxiety and Psychosocial Distress in Advanced Cancer Patients," is being privately funded by the Zurich-based Heffter Research Institute , which promotes the use of psychedelics for the alleviation of suffering. Fully approved by the Food and Drug Administration (FDA), it adheres to rigorous safety guidelines and protocols. Researchers hope that it will one day lead to reclassification of Schedule 1 hallucinogens so that doctors may prescribe them to patients for palliative care, depression and even addiction. "It's daunting working with people in the midst of death," said principal investigator Dr. Stephen Ross, assistant professor of psychiatry and director of the NYU Langone Center of Excellence on Addiction. "To help people to have a good death, and not more chemotherapy, to prepare for the final part of life and to die with dignity and do it in a way that they are not frightened, that is one of the most important endeavors as a physician." Ross and his colleagues are looking for 32 patients who are willing to participate in the random, double-blind study. To be eligible, patients must be 18 to 76 years old with the diagnosis of a "potentially life-threatening disease" or advanced or recurrent cancer who are displaying symptoms of acute stress, anxiety or adjustment disorder due to their disease. Patients are screened carefully -- those with psychotic spectrum disorders, such as schizophrenia, bipolar disorder and severe depression cannot participate. "Mysticism is really the cornerstone of all major religions going back millennia," said co-principal investigator Anthony Bossis , professor of psychiatry and anesthesiology at the NYU School of Medicine. "It is characterized by a sense of unity, transcendence, connecting to the broader universe and a sense of life and the promotion of personal spirituality," he said. "It recalibrates how we see our life and gives a sense of sacredness and reshapes how we view death." A mystical experience can help root patients like Nicky more in the present, according to Bossis. "People with cancer can spend their final days and months not anxious and improvement in quality of life is attainable," he said. "These experiences have the potential to do that." Scientists across the country have shown a renewed interest in the medical uses of hallucinogens. So far, 80 to 90 patients have had similar experiences in studies on psilocybin at other universities including Johns Hopkins and UCLA. In a study on 36 patients at Johns Hopkins, researchers looked at the effects of psilocybin on depression. At the 14-month follow-up, more than 60 percent of volunteers rated the experience as among the five most meaningful and spiritually significant of their lives; 58 percent reported a "complete" mystical experience. "We have come a long way in pain management with the use of opiods , but the sheer anxiety is so hard to address in a medical setting," said Bossis, a clinical psychologist whose specialty is end-of-life care. "The heart of this study is to address these levels of suffering and get at the existential [fear] of not being here any longer that we all face," he said. "We provide an empirical experience where the patient goes into a journey -- his own journey -- and can find resolution and peace and transformation and return back here to integrate it into their lives." Psilocybin, an alkaloid compound in the tryptamine family, is produced by hundreds of species of fungi and acts on the serotonin receptors in the part of the brain responsible for non-verbal imagery and emotion. Its mind-altering effects can last anywhere from three to eight hours. It is in the same class of chemicals as mescaline, contained in the peyote cactus, which is used in religious ceremonies by Native Americans, and dimethyltryptamine, which is in ayahuasca, used by indigenous South American religions. The effects are sometimes described as similar to near-death experiences. Some research has shown that brain activity under psilocybin mimics closely that of Buddhist monks meditating. "It appears we are hardwired with neuro-circuitry to meditate and have the spiritual experience," said Ross. Psychologist Timothy Leary popularized hallucinogens like LSD in his 1964 book with Ralph Metzner, "The Psychedelic Experience," which he hailed as a way to "journey into new realms of consciousness." "It opens the mind, frees the nervous system of it ordinary patterns and structures," Leary wrote. Experiments with LSD took place as early as the late 1940s and 1950s, after it was discovered in an ergot fungus by Swiss chemist Dr. Albert Hoffman. By 1965, more than 2,000 papers had described positive results in 40,000 patients with few side effects and a high level of safety in the treatment of psychiatric orders, depression, sexual dysfunction, bereavement and even addiction, according to the British Journal of Psychiatry. But by 1966, the drug was made illegal after abuses by the hippie counterculture, scientists distanced themselves and the government cracked down on research licenses. By the 1970s, under pressure from the U.S. Justice Department, virtually all research ended. "It got demonized as a most addictive drug, but the irony is that it is not addictive," said Ross. "Used in the models we describe, it can actually lead to sustained sobriety." Volunteers in the NYU study agree to take part in two full-day sessions, seven weeks apart, where they are administered either a placebo or the psilocybin. They are monitored for anxiety and outcomes two to four weeks prior to drug administration, then one day prior, then again seven hours, one day and several weeks' intervals until 26 weeks post administration. Investigators also measure depression, pain and quality of life as well as attitude toward their disease progression at designated intervals. Beforehand, they undergo preparation for the experience in psychotherapy. "We take their life narrative and their cancer narrative and review all the safety parameters -- what happens if X," said Ross. When the drug is administered, the patient is paired with a male and female therapist to monitor responses and for comfort. "Emotional stability optimizes the chance for a good experience," said Bossis. "Trust with the monitors is crucial . If the patient doesn't feel safe, we don't go forward." Sometimes the experience is traumatizing, but facing fears is part of the process. Doctors have an antidote to abort the experience, if necessary, or use valium to calm a patient down. "We encourage them to go inward, to minimize the communication with us and enter the experience, even if it's something dark and difficult that comes before them," said Bossis. "We tell patients that no matter where they find themselves, they will return to a normal state of consciousness within six hours." Two of the three patients in Nicky's group have already died. Both reported extraordinary experiences -- "a cleansing of the body and soul of grief and sadness and an increase in the acceptance of the disease and the dying process," according to Bossis. The patients said they wanted to give back more -- financially or emotionally – and were able to reconnect with estranged friends and family members. Both were "peaceful and thankful," at the end, he said. As for Nicky, the first hour of her psychedelic journey was awe-inspiring, but the second part was deeper and more emotional. At several points, she had to sit up and take off her eyeshades and seek the comfort of Ross and her other therapist. "I became profoundly sad, and I actually had to sit up after 45 minutes and talk to them and I cried a lot," she said. "There was another scenario, then I went through the rest by myself." In six hours, when it was all over, she stayed and analyzed her experience with the doctors. "In therapy we had been working on my top five [issues with death or family]," she said. "During my experience, I reordered the hierarchy of issues to lead a more authentic life emotionally. I didn't realize my number four was actually number one." "It was such an enormous gift," said Nicky. "It's really amazing that a king's ransom arrived at my door step." Today, Nicky said she would take psilocybin again -- "in a New York minute." She continues her therapy at NYU and will go on a drug trial soon for late-stage ovarian cancer. She also hopes that her openness about the psychedelic experience will help others. "I don't think people should be so afraid of something that could be so helpful when you are nearing the end of life," she said. "I had huge insight into my head. I can still conjure it up and I tried for very long to relive it -- it was breathtaking." Nicky never expected to find God. "I didn't have that spiritual experience, but my dome was very close," she said. "When it opened up several times and let in the light, I would have thought it was my creator if I had been religious." For more information on how to participate in the study, contact patient coordinator Krystallia Kalliontzi at 212-998-9252 or kk71@nyu.edu.